The Simeone Museum has already been covered in this blog as a great place to see vintage sports cars with racing provenance (see 2 degrees of separation). Some of the vehicles there are among the most sought after in the world. And they are displayed beautifully in settings that would make Hollywood proud. The Mille Miglia winning Alfa Romeo passing through the quaint Italian village, and the Cobra Daytona Coupe on the Bonneville Salt Flats. The museum has been dedicated to four wheels, but on this Particular Saturday, Hot Rods filled the parking lot for an outdoor show complete with Rockabilly band, and motorcycles filled the center of the museum's display area. First a disclosure. The event name was misleading and should really have had read Classic Italian Motorcycles. Almost every one of the bikes on display was Italian. Not that there is anything wrong with that (I am a former owner of a 999). Classic Italian motorcycles could have filled the entire museum with nothing but great machines and passionate designs. Its just that I was expecting more given the varied nature of the cars in the collection. There were about 30 bikes on display from some of the most prominent Italian Marques; Moto Guzzi, Moto Morini, Laverda, Parilla, MV Agusta, and of course Ducati. Now for one of motorcyling's great mysteries. How is it that the Italians can make small bore motorcycles so appealing? And so desirable in race trim? I mean, everyone was making small bore stuff in the post war period out of necessity for cheap transportation, but Italy produced a lot of beautiful machines of 250cc or less. And it was not as if they did not produce some great "big" bikes as well. The Benelli Sei, the Ducati 750, Moto Guzzi V7 Sport, etc. And this is separate from the wonderful scooters that they also brought to the world. But I digress. 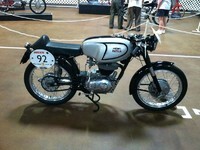 On prominent display was one of the Ducati 750 Super Sport bikes just mentioned in Paul Smart silver and aqua trim. The styling has been reproduced in the current series of modern bikes, but the original is still a stunning bike, and it must have looked positively supersonic at the time it was new. The bikini fairing and the rest of the bodywork said "fast bike" in every language. A proper cafe racer back when you actually raced between cafes. Despite having a Ducati 916 on display, my favorite "big" bile was a Laverda 1000 Jota. On this bike, orange (not usually my favorite color on a motorcycle) is absolutely perfect, and the bike looked great. You can readily see why the allure of this bike overwhelmed its mechanical reputation. The stars of the exhibit though were clearly the small bikes. The glory days of small bore bikes and their jockeys (at least from the Italian perspective) were back for a day in the museum. Parilla and Garelli, Aprillia and Ducati had 125cc to 250cc bikes present that were all expertly restored to period racing trim consistent with the Simeone theme. My new favorite small bike has to be the 175cc Ducati solely because of the stunning example in the show. Everything from the paint to the engine was delicious, and my only regret is that this bike is probably too nice to ride anything more than parade laps. Not that it makes a difference, because I think I weigh more than the bike. Even looking at the controls, it was obvious that these guys must have been a lot smaller than me. In any case, the simplicity and elegance of the bikes made them pleasing to view and probably great to own and ride. I may have gone in expecting more, but it allowed me to spend some quality time looking at motorcycles that might otherwise have received less than their due respect. Time well spent.